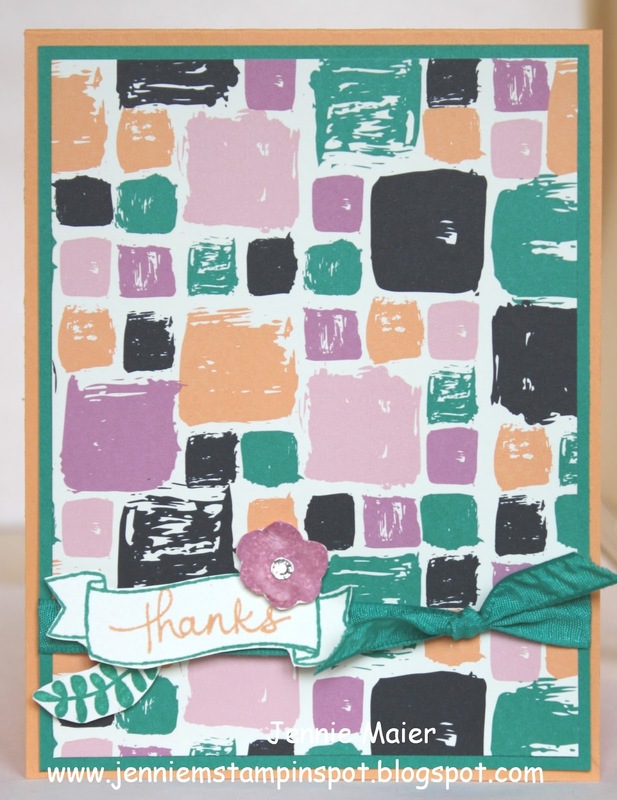 I needed a thank you for friends so I used the Pals Paper Arts#302 here. Again, using all goodies that will retire on May 31st. 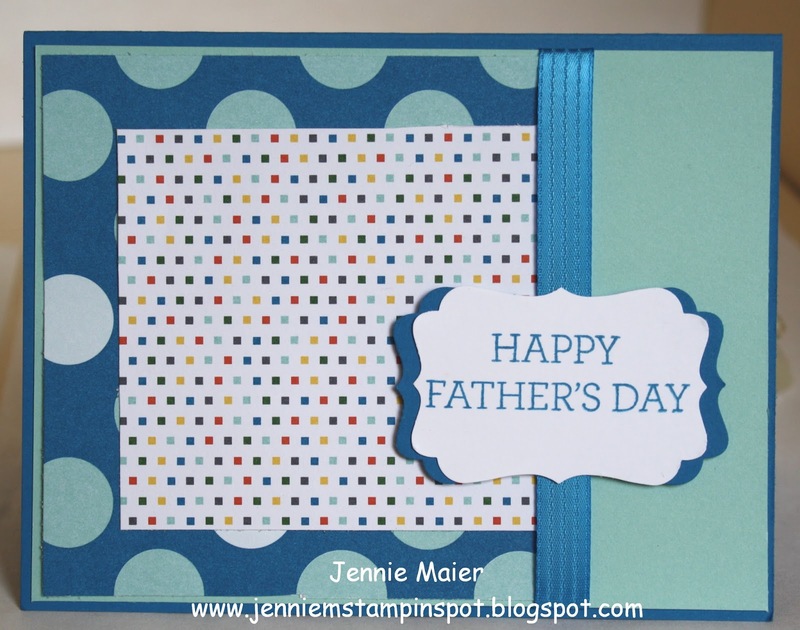 Tag Talk and Something to Say are the stamp sets with some Typeset Specialty DSP. 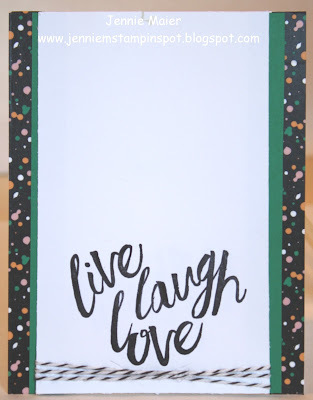 This card covers a sketch and a color challenge. First, I used the Freshly Made Sketch#238 here. And I combined that with the Splitcoast Color Challenge#584 here. 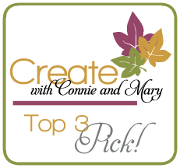 The colors to use are Watermelon Wonder, Crushed Curry and Pumpkin Pie. 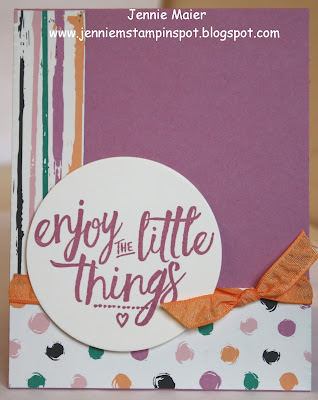 the stamp sets-Petite Pairs and Six-Sided Sampler, the Cherry on Top DSP Stack, the It's My Party Enamel Dots and the Candy Dots and the Hexagon punch. This card uses the MojoMonday Sketch#449 here. Crazy About You is the stamp set with some retiring DSP, Schoolhouse DSP. 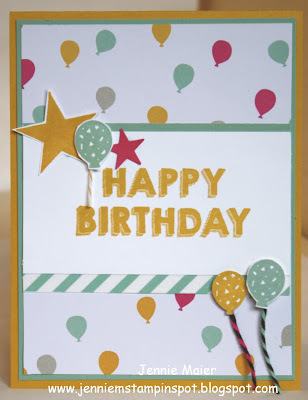 This birthday card uses The Paper Players Sketch Challenge#296 here. Party Wishes and Something to Say are the stamp sets (both to retire) and there's some Cherry on Top DSP Stack (also to retire). 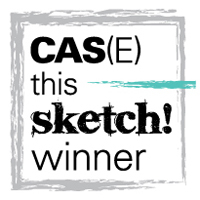 This CAS card is for the Freshly Made Sketch#237 here. 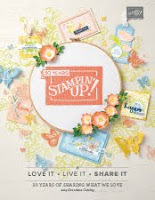 New Catalog goodies include the stamp set, Layering Love and some Playful Palette Designer Washi Tape. 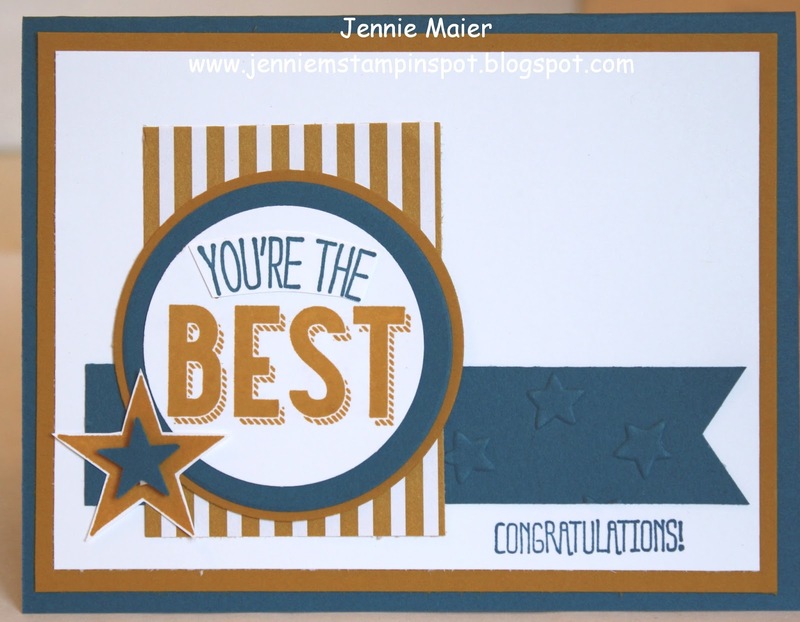 This graduation card uses the Fab Friday Challenge#87 here. I mixed some retiring things with a new In-Color, Dapper Denim. 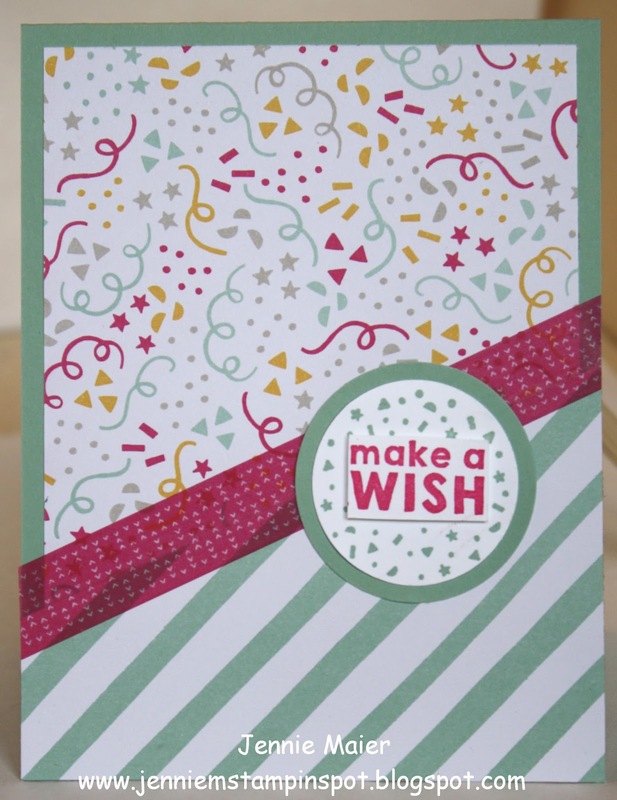 Friendly Wishes, Perfect Pennants and Something to Say are the stamp sets with some 2015-2017 In Color Envelope paper. 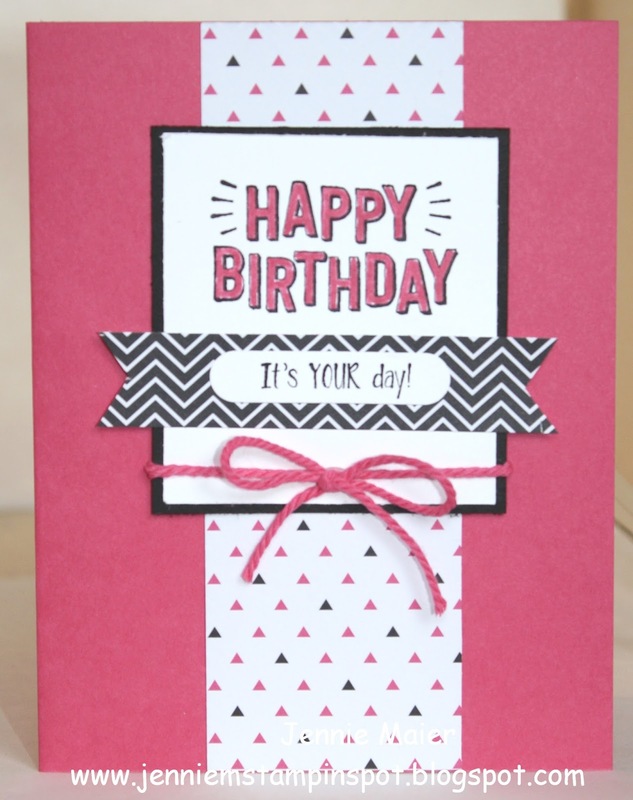 This card uses more Pop of Pink Specialty DSP. 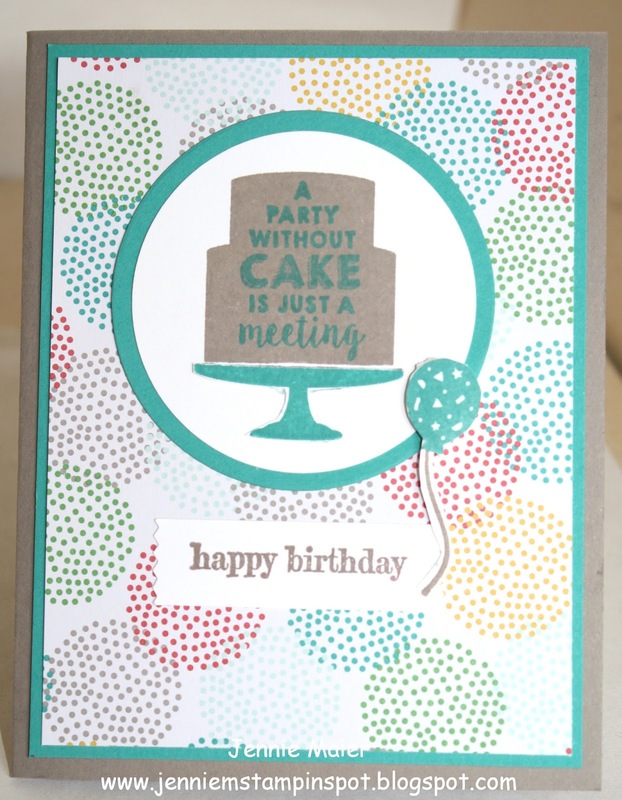 It also uses the new Confetti Celebration stamp set. And it's for the Mojo Monday Sketch#448 here. I added some retiring Baker's Twine Combo Pack cuz it just coordinates sooo well! 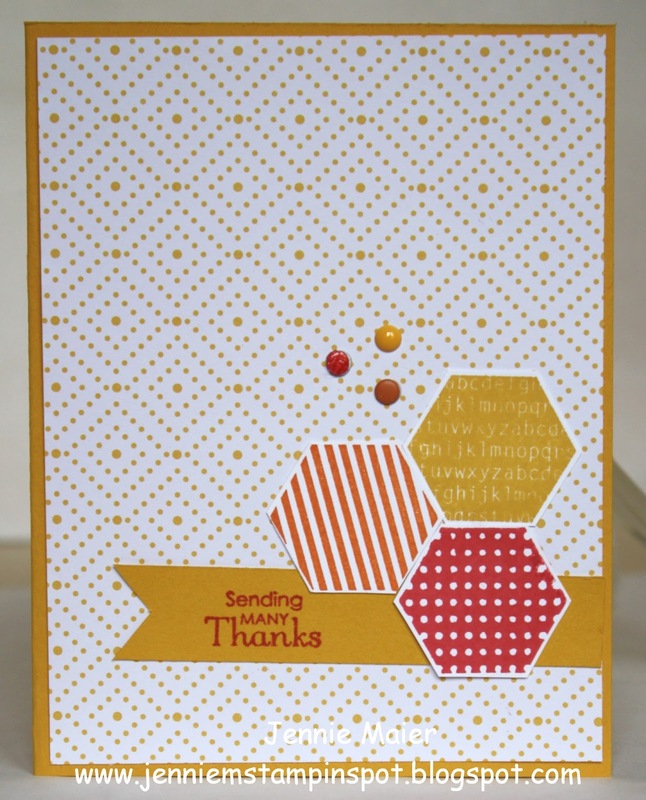 This thank you card uses the Can You Case It#120 here. 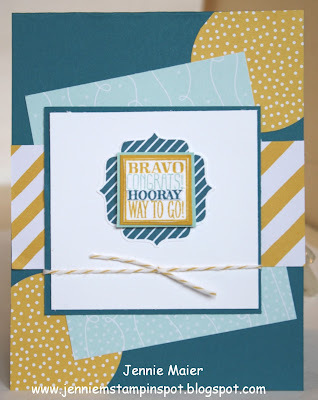 The stamp set is Endless Thanks with some of the new Playful Palette DSP Stack and new In-Color, Emerald Envy 3/8 inch Ruched Ribbon. It's My Party- and I'm Going to Miss It! 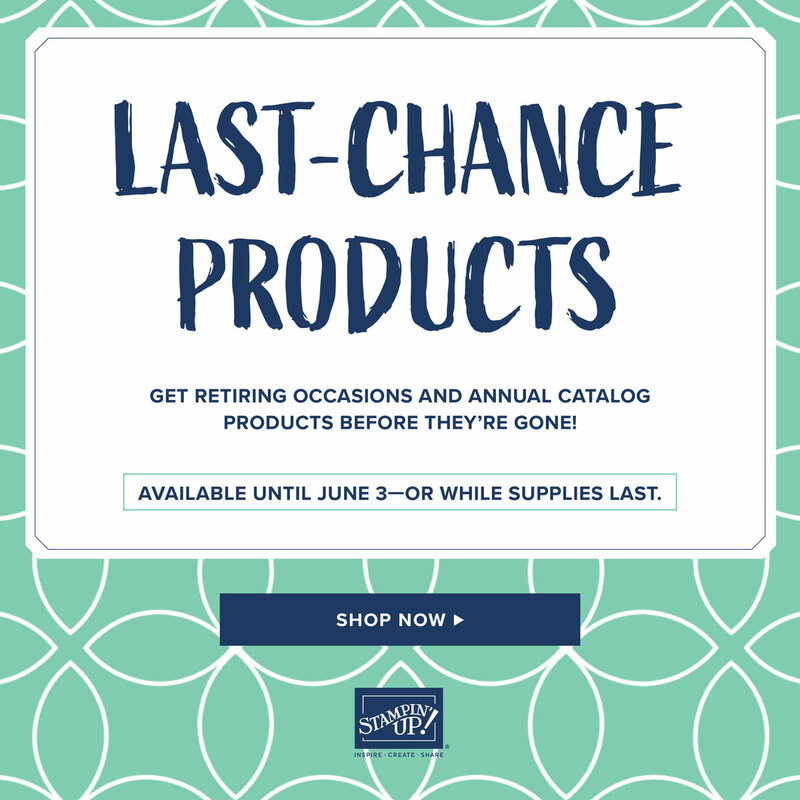 Back to some retiring products. Saying it again, I will really miss this DSP! Having said that, this card qualifies for the SUO Challenge#148 here. And I also used the Splitcoast Sketch Challenge#592 here. 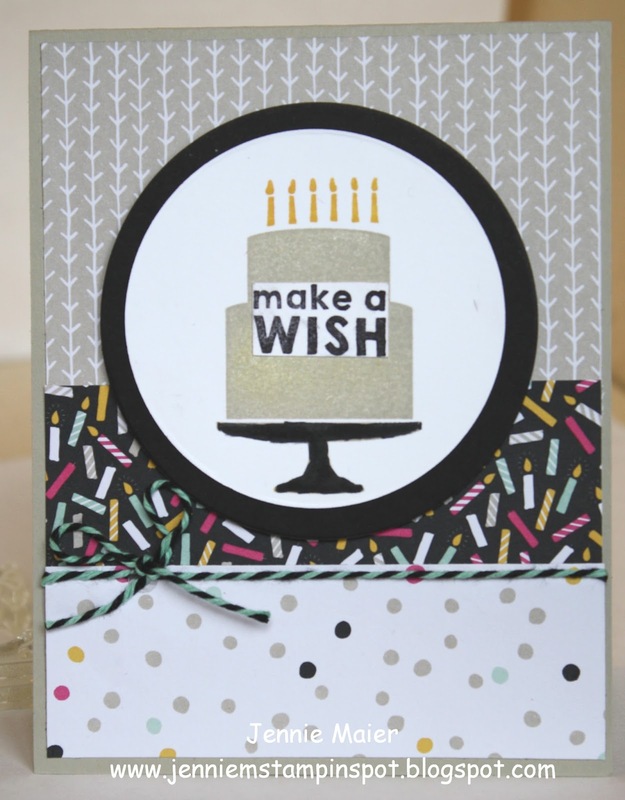 Party Wishes is the stamp set with some It's My Party DSP. Here are some more goodies from the New Catalog. The new stamp set is called Confetti Celebration and there's some new DSP, Pop of Pink Specialty DSP. Also new, Melon Mambo Thick Baker's Twine. 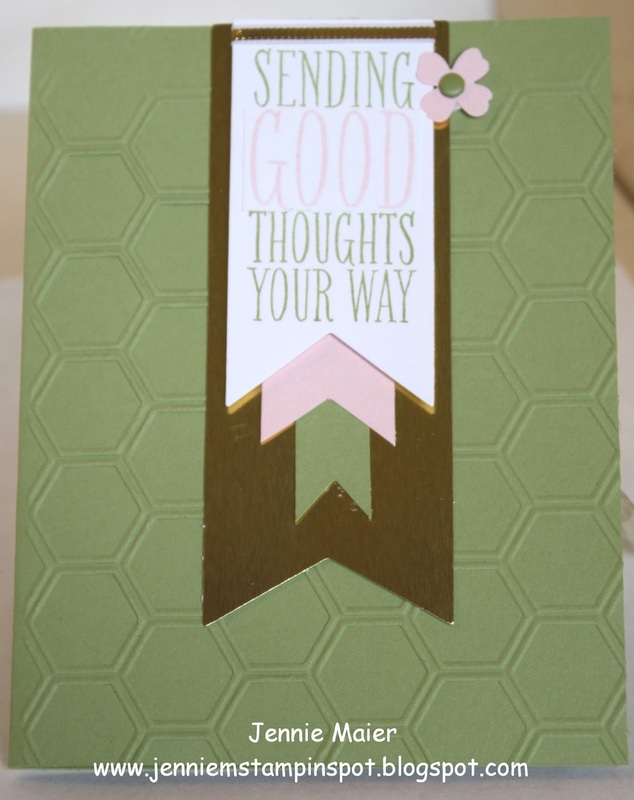 And this card uses the Pals Paper Arts#300 here. My New Catalog pre-order just arrived so I had to play! I used the Freshly Made Sketch#236 here. 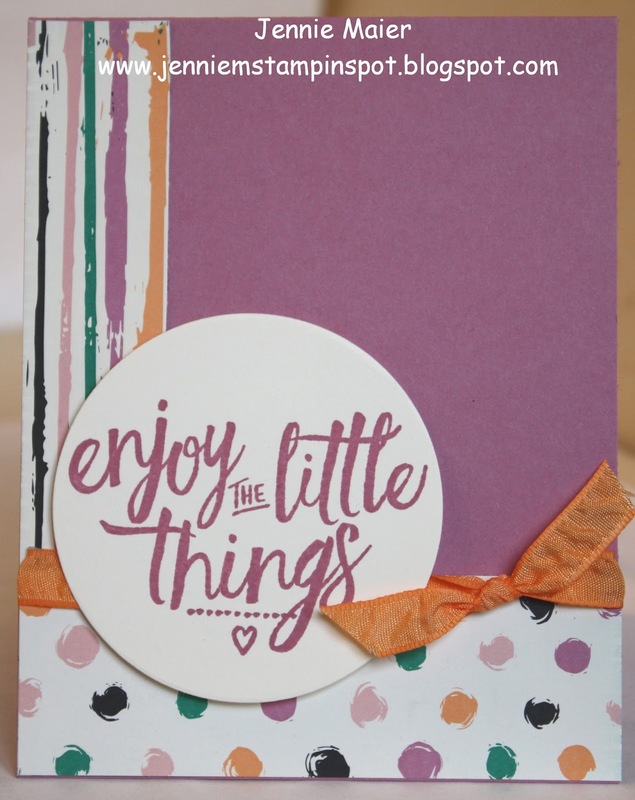 The new stamp set is called Layering Love and I paired that with new DSP, Playful Pallete DSP Stack. Also new is the In-Color, Sweet Sugarplum and the new ribbon, Peekaboo Peach 3/8 inch Ruched ribbon. Here's another card showcasing retiring goodies. 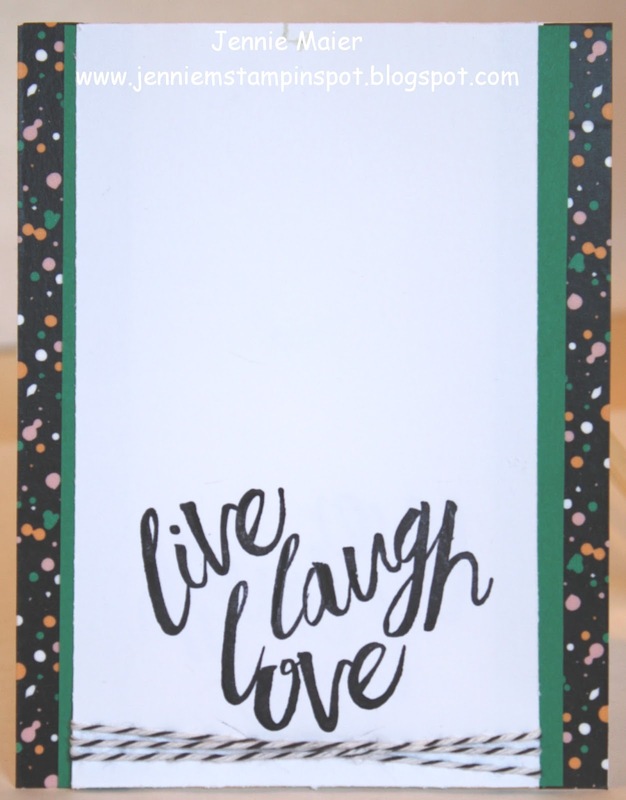 It's also a double-duty card for a sketch and a color challenge. First, I used the MojoMonday#447 here. And then the TGIF Challenge#54 here. It's a color challenge to use Island Indigo, Pool Party and Crushed Curry. 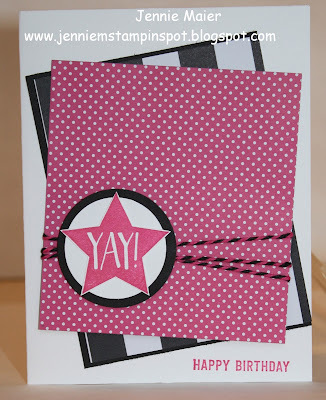 Tag Talk is the stamp set with some Cherry on Top DSP Stack and It's My Party DSP Stack. The only things used on this card that aren't retiring are the Crushed Curry Baker's Twine and the 2 inch Circle punch. 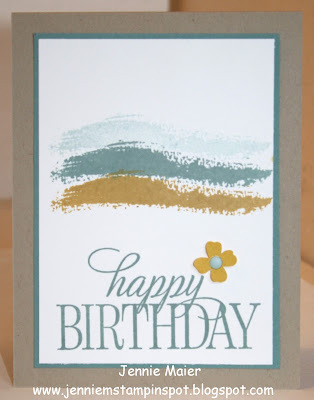 This card uses quite a few retiring products and the Pals Paper Arts#299 here. 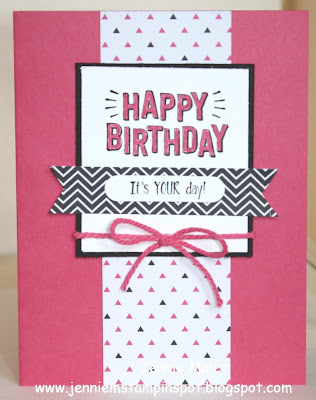 It's a color challenge to use Pink Pirouette, Pear Pizzazz and Gold. 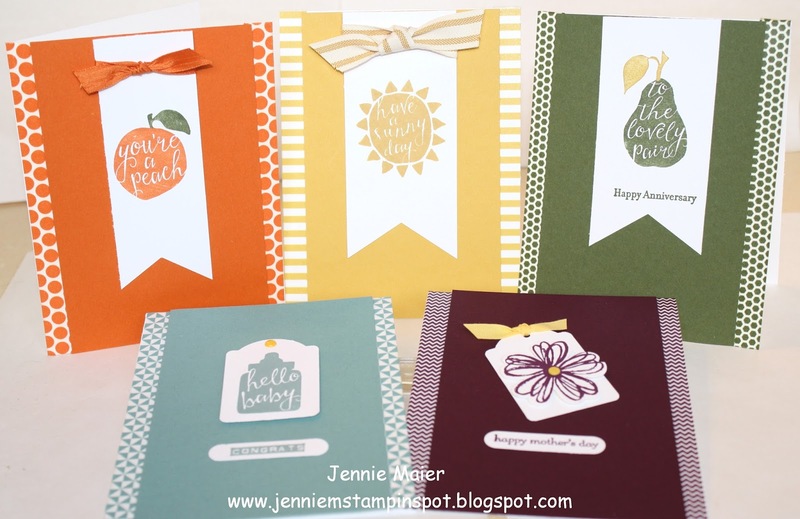 Perfect Pennants, Honeycomb Embossing Folder, Itty Bitty Accents punches pack and the Subtles Candy Dots are all retiring. This card uses a sketch and a color challenge. First, I used the Freshly Made Sketch#235 here. 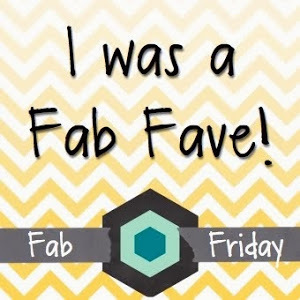 And then the Fab Friday #86 here. 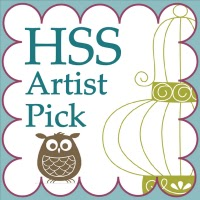 It's a color challenge to use Soft Sky, Lost Lagoon, Hello Honey and Crumb Cake. 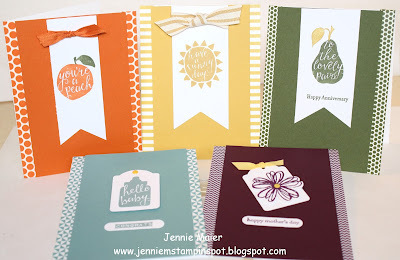 Sheltering Tree and the soon to retire Hostess set, Happy Birthday, Everyone are the stamp sets. 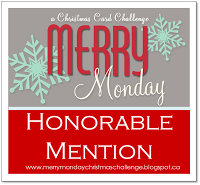 This card is for the MojoMonday Sketch#446 here. Party Wishes is the stamp set with some It's My Party DSP Stack. Saying goodbye to these retiring In-Colors, including the In-Color Designer Washi Tape. Also used a retiring hostess set, Silhouettes & Script. 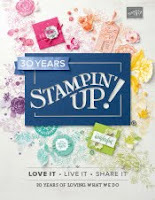 The other stamp sets are Flower Shop and Teeny Tiny Wishes and thank goodness they're sticking around! 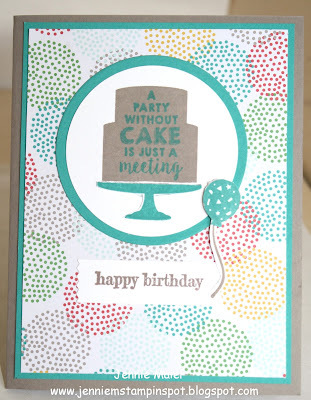 Since I had the Party Wishes stamp set and the It's My Party DSP Stack out, I used them again for this card. And I used the Splitcoast Sketch Challenge#590 here too.